^ Memorie istorico-critiche di Antonello degli Antonj pittore Messinese by Tommaso Puccini, Florence 1809. ^ a b c Barbera 2005, p. 13. ^ a b Barbera 2005, p. 14. ^ The letter to the Venetian Marcantonio Michiel, of 20 March 1524, reporting on the state of art in Naples, and works there by Netherlandish painters, dwells upon Colantonio and his Netherlandish technique, which one sees assimilated in the art of Antonello; it was published by Fausto Niccolini, L'arte napoletana del Rinascimento (Naples) 1925:161-63. It is translated in Carol M. Richardson, Kim Woods, and Michael W. Franklin, Renaissance Art Reconsidered: An Anthology of Primary Sources (2007:193-96). ^ Barbera 2005, p. 15. ^ "Antonello da Messina". Benezit Dictionary of Artists. Oxford Art Online. Oxford University Press. Retrieved February 13, 2017. ^ a b Barbera 2005, p. 23. ^ a b Barbera 2005, p. 51. ^ Pope-Hennessy 1966, p. 60. ^ Barbera 2005, p. 22. ^ Barbera 2005, p. 29. Barbera, Giocchino (2005). Antonello da Messina, Sicily's Renaissance Master (exhibition catalogue). New York: Metropolitan Museum of Art Yale University Press. ISBN 0-300-11648-9 (online). Pope-Hennessy, John (1966). The Portrait in the Renaissance. London: Phaidon. This article incorporates text from a publication now in the public domain: Chisholm, Hugh, ed. (1911). 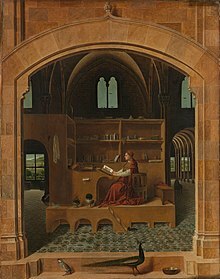 "Antonello da Messina" . Encyclopædia Britannica. 2 (11th ed.). Cambridge University Press. p. 148. 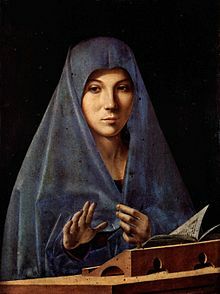 Wikimedia Commons has media related to Antonello da Messina. Antonello da Messina in the "History of Art"
"Antonello da Messina" . Catholic Encyclopedia. 1913. This page was last edited on 13 November 2018, at 23:13 (UTC).